Great day trip to the blue mountains! Jam packed day. Glad we had an early start to avoid the huge tour buses at scenic world. Nice small group tour and our guide Kat was friendly and very informative - sharing her knowledge of Sydney, Australia and the blue mountains/surrounding area. We were lucky that the mist lifted at the blue mountains so that we could see the sisters, waterfall and amazing view. Lunch was served as soon as we arrived at the hotel, I had the grilled fish which was good. I think some other people were disappointed with their lunches. After lunch we stopped at 3 different lookout points to take some great photos. The wildlife place was good, probably better for children than adults. Lots of kangaroos (which hop around the zoo and you can feed) and koalas to see, with talks in the afternoon at feeding time. We found this tour to be well organised and fun. 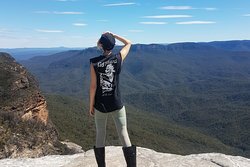 I've visited the blue mountains before but found out some more interesting details which I didn't know about. The guide Kat made sure we all did everything we could despite a tree having fallen we still took a short walk down past the old coal mine at Scenic World. The weather which threatened to rain held off till the afternoon giving us some love clear early morning views. The lunch was very filling and Leura is a little gem in the mountains to visit. We also really enjoyed Featherdale finding the koalas both charming and cute. Saw some birds I'd never seen before and found our bin chickens don't just raid our city bins. They like to steal fish out of the penguins mouths also. Plenty to see and do. Bus trip back to the ferry was again enlightening. Finding out a few more things about Sydney which I didn't know and then Kat took us for a quick look around Sydney Olympic Park. This was appreciated by quite a few on the trip who loved seeing these buildings before a short trip to the ferry. Thank you to Anderson's Tours for both a entertaining and enlightening day out. The weather wasn't very cooperating, and visibility was low, but it was all made up by the excellent Driver/Guide Kat. She was amazing. Was at the pick up point before stated time. From the moment she started from there, she spoke non-stop, going thru the city,picking up others, describing the city to us. Off to the mountains, and she continued, answering tons of questions. She kept narrating, even when almost everyone was asleep and she could see it in her rear view mirror. And, she was funny. She found things for us to do, even doubling back to a look out when weather suddenly cleared for a while. She genuinely felt bad about the weather and gave us a tour around the Olympic park before dropping us at the ferry wharf. Anderson tours were very responsive before I booked, answering my queries via email about best pick up point and such. The only thing - their website wasn't using https and I wasn't comfortable booking there, so I booked via another TP website. The bus was decent, lunch was awesome, a hot lunch in a good restaurant, not a packed sandwich. I did miss the morning tea and cookies - something we got on GOR tour in Melbourne. We enjoyed, despite the bad weather, and all because of the great organizers and the guide. 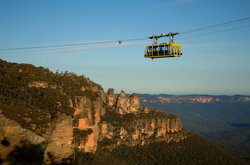 We visited Day Tour to Blue Mountains on 14th March with Tour Manager Ms.Kat (Catherine).. Excellent all day tour. They arranged pick up at a location near our hotel and we ended the tour in the ferry. Well organized, lots to see and experience. Contacted company via email the questions I had and they quickly responded. Highly recommend.